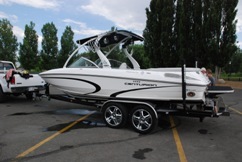 When you rent a Utah boat rental from us you get the very best in performance at a reasonable price. Most of our power boats are only a few years old and well maintained to our high standards. We guarantee a clean well maintained boat, dependable and functional. We have a number of makes and models in our line up to try to fit the needs of different individuals and groups. Utah offers some of the best lakes for the boating enthusiast from Desert lakes like Lake Powell to mountain lakes like Deer creek, Jordanelle or Bear Lake. No summer is complete with out a water sports outing to your favorite lake. Whether it is just a day with the family at Yuba Lake or a week long houseboat vacation Utah Rent-A-Boat & TK Watersports can take care of you. Some of our most popular boat rentals have been our Centurion Enzo SV240, Centurion Enzo SV230, Centurion Avalanche C4, Malibu Wakesetter 23 ft and Mastercraft X-45. Many of our boats are equipped with wake enhance equipment to manipulate the size and shape of the wake for wakeboarding, wake surfing. We provide Utah boat rental service to all cities and lakes in Utah including lake powell( Bullfrog & Wahweap marinas)Bear Lake, Deer Creek, Jordanelle, Utah Lake, Willard bay and more. 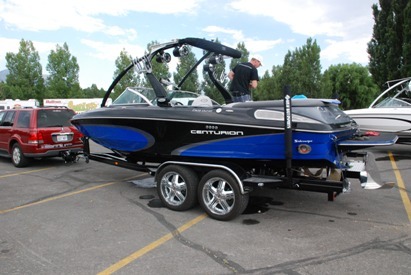 This blog about Utah boat rentals is very much informative and people can easily get idea to take Ski Boats, Power Boats. Aqua Elite Events Miami Boat Rentals & Luxury Yacht Charters company in Miami FL. You mentioned excellent information for boat rentals So Book Now and get great discounts on tours and attractions throughout Punta Cana. Thanks for the post! I'm planning on going to Lake Powell with a few friends this weekend. I think that it would be a fun idea to rent a boat to take out on the lake. I think that it is so great how you can rent boats. I love boating with family and friends in the summer. I think that it would be so fun to rent a boat and go out one last time before school starts. Thanks for sharing this information.